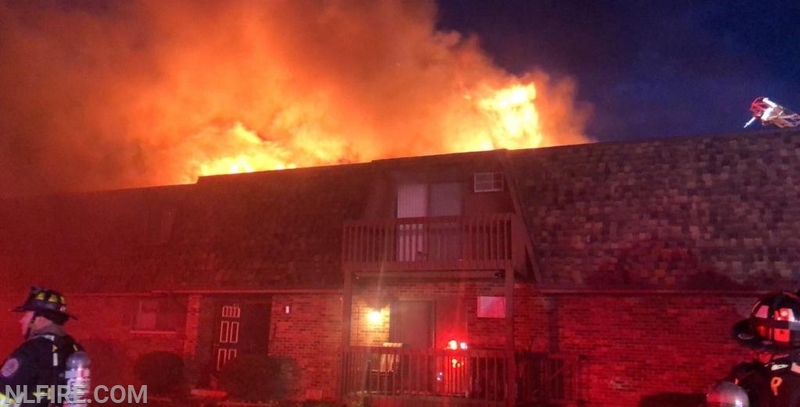 This morning, just after 5 a.m., the New Lenox Fire Protection District received a call for a structure fire in the 1200 block of Timber Place. Once the NLFPD arrived on scene, they confirmed the fire in a two-story apartment building with five units inside and upgraded the fire to a full-still response. The fire was again upgraded to a box alarm just after 6 a.m. and was under control by 6:30 a.m. There is heavy fire and smoke damage on the second floor and water damage to the first floor. Two people were transported to an area hospital in stable condition. Five families have been effected by the fire. The New Lenox Fire Protection District is working with the Village of New Lenox on securing a donation point for anyone who would like to help the families. Assisting the NLFPD on the fire scene and with coverage for any additional calls for service during the fire were: Frankfort, Manhattan, Mokena, East Joliet, Peotone, Minolta, Argonne, Romeoville, Homer Township, Northwest Homer, Lockport, Orland, Elwood, Rockdale, Troy, Palos, Lemont and Wilmington Fire Protection Districts. The cause is currently under investigation by MABAS 19 Investigation Team, Will/Cook/Grundy Investigation Task Force, ATF, and the Illinois Office of the State Fire Marshal.